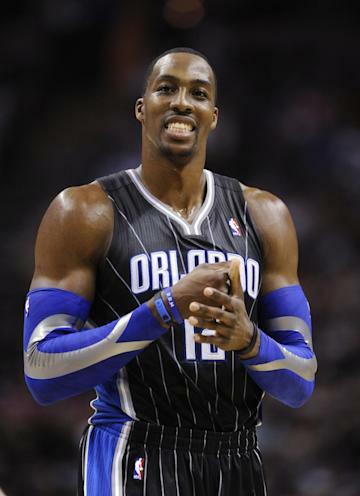 The Los Angeles Lakers have completed their blockbuster four-team trade to acquire Dwight Howard from the Orlando Magic, league sources told Yahoo! Sports. The teams finalized the trade on a call with NBA officials Friday afternoon. Lakers forward Pau Gasol had been in previous scenarios of the trade, but his representatives were assured Thursday night that he was no longer in the deal. The trade ends a difficult year of uncertainty for Gasol, who was initially traded to the Houston Rockets in a three-team deal for Chris Paul before NBA commissioner David Stern blocked the trade. The Lakers again discussed moving Gasol at the trade deadline and he heard his name in talks for Howard all summer. "After a while I've been able to block it out," Gasol said. "So I'm relieved." Orlando, Los Angeles and Philadelphia had discussed a three-way deal, but needed a fourth team to take Iguodala and also provide Orlando with the necessary future draft picks, sources said. Denver joined the talks in the past week, sources said. Howard's contract ends after this season. He isn't expected to immediately sign an extension with the Lakers because he can get a longer deal in free agency. Bryant, who is playing for Team USA in the London Olympics, confirmed the trade on his Facebook page. "Well, it looks like Superman has found a home," Bryant wrote. "…The Lakers have landed a piece that will hopefully carry the franchise long after I'm gone. I have spoken to Dwight Howard, and we are locked and loaded to hopefully bring back the title."